Thanks to your support, WaterWatch and project partners successfully completed demolition in summer 2015 and removed Fielder and Wimer dams from Evans Creek in the Rogue Basin. These two obsolete dams ranked fourth and eighth on the state of Oregon's top fish passage barrier priorities list. Their removal reconnects up to 70 miles of high-quality habitat in Evans Creek and continues to build on our highly successful "Free the Rogue" campaign, which has now helped achieve the removal or notching of Savage Rapids, Gold Hill, Gold Ray, and Elk Creek dams to benefit Rogue Basin salmon and steelhead. All funds generated in this campaign helped our work in bringing down the dams, and this campaign is now complete. Thank you! Keep an eye out for upcoming projects to continue our mission to protect and restore streamflows in Oregon's rivers. We couldn't do this necessary work without such dedicated supporters. Click here to view more WaterWatch accomplishments in 2015! Thanks to your support, in late April, WaterWatch was able to leverage another $79,000 for the second and final phase of this project. Now, we're on the verge of completing the project and securing major benefits for the Rogue River and its fish. 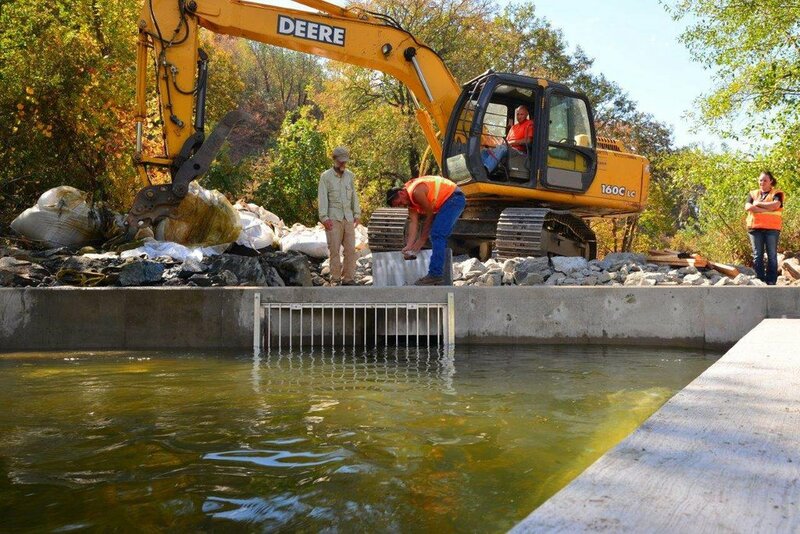 This summer, we expect to have contractors install the remaining pipe and complete construction of the fish exclusion device at the Gold Hill Irrigation District Diversion dam to complete this improtant project for the Rogue's fish. Once completed the project will prevent fish from entering the district's diversion and give the district control over the amount of water that enters its system. This will leave more water in the Rogue River and help solve one of the major fish passage problems on the main stem Rogue River. Please help us complete this project to protect migratory and resident fish and leave more water in the Rogue River. Phase I of the project is now complete and is already providing benefits to irrigation district patrons, the Rogue River and its fish. The first phase of the project installed a new headgate and fish exclusion system at the top of the irrigation district canal as well as 380 feetof pipe to replace the open canal diversion. In the fall of 2014, we rescued stranded fish and completed the first part of construction at the project. Now, pending funding, Phase II will install and bury another 700 feet of pipe, install a measuring device and complete the project. Some grant proposals are pending that, if successful will provide some funding to complete the project. Many organizations and anglers are supporting the project. If funding is secured, Phase II should be completed in 2015. When completed, this project will benefit the patrons of the irrigation district, leave more water in the Rogue River, and help the Rogue's fish. Progress to Report - Thanks to You! The project to fix the Gold Hill Irrigation District's (GHID) diversion dam on the Rogue River will compliment and leverage the benefits to fish and the Rogue River from the recent removal of 4 major dams in the Rogue Basin - Savage Rapids Dam, Gold Ray Dam, Gold Hill Dam and Elk Creek Dam. 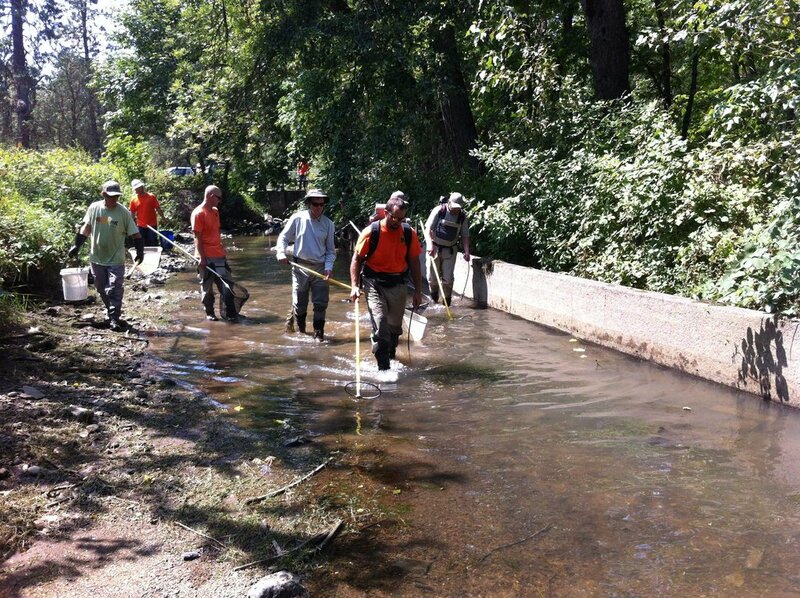 The GHID project helps continue one of the most successful river restoration campaigns in the nation. In 2011, WaterWatch and GHID entered into an agreement to secure funding to improve fish passage at the GHID dam and diversion on the Rogue River. WaterWatch secured a grant from Oregon and retained an engineer to develop designs. With the cooperation of GHID, and the input and review of a technical team, three alternatives were developed, and reviewed. With the support of the technical team, an alternative was selected by GHID to address the fish passage issues at its diversion. In 2013, WaterWatch entered into a second agreement with GHID to assist in securing funding for implementation of the selected alternative. While some funding was secured, these funds turned out to be less than the bids that came in. The project was therefore broken down into two phases and the funds secured were used to implement key components of the project in 2014. This past summer, a fish salvage operation was conducted. Then, construction proceeded to install pipe and modify the diversion to make it friendly for salmon and steelhead and to modernize the water diversion. The project also includes improtant public safety improvements that will allow for safer access to the Rogue River in this area. Finally, the project will leave more water in the Rogue River in the vicinity of the diversion. This first phase is now completed and WaterWatch is continuing to work with GHID to secure the additional funds needed to complete Phase II of the project as originally designed in 2015. We need your help to complete this ecologically important project in 2015. WaterWatch has been working with the Gold Hill Irrigation District (GHID) to improve fish passage at its irrigation diversion on the Rogue River. With the removal of Savage Rapids Dam, City of Gold Hill Dam, and Gold Ray Dam and the notching of Elk Creek Dam, GHID’s diversion dam is now the highest ranking fish passage priority on the Rogue Basin Fish Access Technical Team's priority list. This project will benefit spring and fall chinook salmon, summer and winter steelhead, ESA listed coho salmon, cutthroat trout, and lamprey. 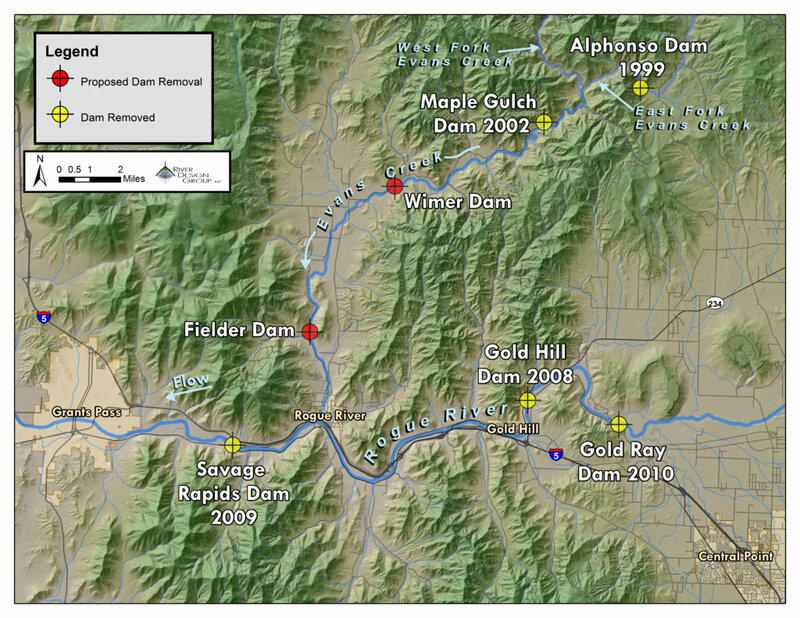 The GHID diversion is on the mainstem of the Rogue River between the previous Gold Hill and Gold Ray dam sites, and will compliment and enhance the benefits of the other restoration efforts on the Rogue River. This project was developed with a technical assistance grant from the Oregon Watershed Enhancement Board (OWEB), which allowed alternatives to be developed to solve the fish passage issues at the GHID’s diversion. With input from and consultation with the irrigation district and multiple state and federal agencies, alternatives were developed and an alternative selected. Based on the engineers estimate, $283,000 in funding and in-kind match were secured for final engineering, environmental review and permitting, preparation of contract documents, administration, and project management. Permits have been secured and the project is slated to begin in late August this year. Unfortunately, the low bid out of 6 bids came in $88,000 over the funds secured for construction ($151,000). We are now negotiating with bidders and discussing doing the project in stages so that some of the work can begin as scheduled, while additional funds are secured. OWEB has contributed $181,750 toward this project, the Oregon Department of Fish and Wildlife contributed $30,000 as well as work on the bypass system. While we are searching for funding to make up the shortfall, any additional contribution will help reduce the shortfall and help move this project forward with the objective of still getting it completed before the start of irrigation season in April 2015. Thank you for your support of this important project for the Rogue River.